Surprisingly, this dish is made with common spices that you're most likely to find at your local grocery store. Garam masala and curry powder is all you need for spices (aside from salt and pepper) and the flavors definitely pack a punch. The vegetables used in this dish include red potatoes, cauliflower, chickpeas (garbanzo beans) and frozen peas, but you can certainly use your preferred vegetables instead. The dish starts with toasting the garam masala and curry powder together to bring out more flavor. Onions and potatoes are caramelized in a pot and then a mixture of oil, garlic, ginger, and tomato paste is added. The toasted spices are stirred in and the vegetables are added. To finish off the dish, heavy cream or coconut milk is stirred in to create a wonderful creamy sauce that ties everything together. This dish is especially good over steamed basmati rice and garlic naan to sop up the sauce! You'll notice this recipe is adapted from Cook's Illustrated. I was skeptical at first with this recipe but after taste testing, it was pretty darn close to other more authentic Indian recipes I've tried. I chose to highlight this CI recipe because the more authentic recipes I had were way too involved and required more exotic spices that may not be readily available to the mass public. So this version is definitely tasty and approachable too! Toast curry powder and garam masala in small skillet over medium-high heat, stirring constantly, until spices darken slightly and become fragrant, about 1 minute. Remove spices from skillet and set aside. Reduce heat to medium. Clear center of pan and add remaining tablespoon oil, garlic, ginger, and tomato paste; cook, stirring constantly, until fragrant, about 30 seconds. Add toasted spices and cook, stirring constantly, about 1 minute longer. 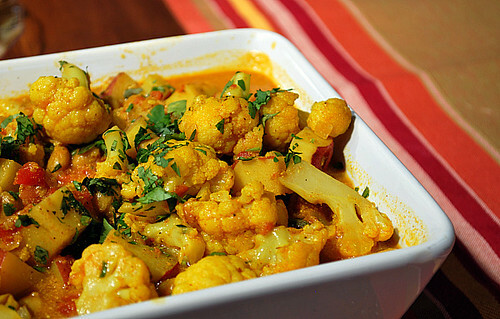 Add cauliflower and cook, stirring constantly, until spices coat florets, about 2 minutes longer. Add tomatoes, water, chickpeas, and 1 teaspoon salt; increase heat to medium-high and bring mixture to boil, scraping bottom of pan with wooden spoon to loosen browned bits. Cover and reduce heat to medium. Simmer briskly, stirring occasionally, until vegetables are tender, 10 to 15 minutes. Stir in peas and cream or coconut milk; continue to cook until heated through, about 2 minutes longer. Adjust seasoning with salt and serve immediately, passing condiments separately. @Justin - I know what you mean! I was skeptical too but after taste testing, it was pretty darn close to other more authentic Indian recipes I've tried. I chose to highlight this CI recipe because the more authentic recipes I had were way too involved and required more exotic spices that may not be readily available to the mass public. So this version is definitely tasty and approachable too! I really enjoyed this. I used vegetables that I had in my crisper drawer and the basic ingredients I was able to find at my local store. I didn't find garam masala, but the curry powder I found contained almost exactly the same ingredients, so I just used extra of that. I also added paneer. YUMMY! !